WITH 2004 GONE, IT IS TIME TO look at what the future holds for airborne law enforcement and firefighting units in 2005. The chief pilot of any law enforcement helicopter operation will tell you that money is still the tail that wags the aviation dog. Flight operations, fleet size and mission equipment acquisitions are driven by massive amounts of money (and the inevitable begging associated with trying to get it). With September 11th fresh in everyone's mind, police and sheriffs' departments are still fighting to keep their fleets airborne and loaded with state-of-the-art mission gear. The good news is that help is on the way. In late 2004, Congress made grant money available through the Homeland Security Dept. appropriations bill. 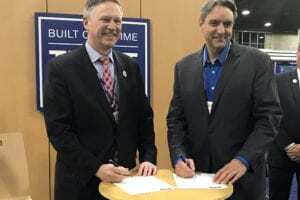 Based on that, state officials released huge chunks of money to aviation units, which has kicked off a coast-to-coast frenzy of orders for new aircraft and specialized mission equipment. The DeKalb County, Ga., Police Dept. 's Aerial Support Unit plans to add a third Eurocopter AS350 to its fleet. The first was purchased in 2002 and the second arrived in mid-2004. The unit also has funds for 12 pairs of ANVIS AN/AVS-9 night-vision goggles. "We're looking forward to a training program geared to incorporate night-vision use in our daily patrols," said Lt. R. M. Rancifer, the unit's commander and chief pilot. The county's eight pilots and six tactical flight officers protect 700,000 residents in their 268-sq.-mi. area of responsibility. In the Arizona desert, Phoenix city officials have authorized the police department's Air Support Unit to make a very dramatic move. "We're going to fly aircraft from different manufacturers," said Officer Phil Tilford, the chief pilot. 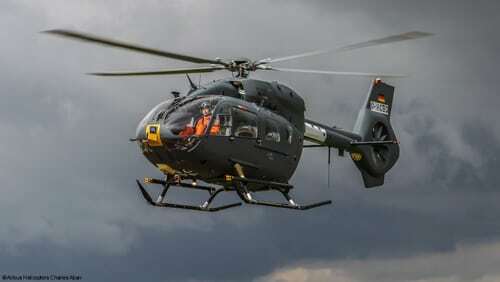 The Eurocopter AS350B3, Agusta A119 Koala, and Bell 407 are contenders for the new aircraft. "We'll buy three aircraft from each of the top two bidders." The theory is to avoid putting all the unit's eggs in one basket. If one aircraft type is grounded, or its manufacturer falls into financial trouble, the unit could rely on another line of aircraft backed by a different company. After a fly-off, the unit hopes by September to have six new aircraft, which will be equipped with a variety of search-and-rescue gear. The goal is to increase SAR capabilities to match the push of residents and hikers farther into the desert. This year, the focus of fire-EMS aircrews will be keeping up with populations spreading out from packed cities to new exurban developments. In most major U.S. metropolitan areas, more and more people are electing to live beyond suburbs, in rural areas of surrounding counties. New housing and industrial developments are being built many miles from the nearest hospital or firehouse. To complicate things, homes are springing up close to fire-prone terrain. "Our population is growing farther to the west near the Everglades," said Cmdr. Jim Hunter of the Miami-Dade County Air Rescue Unit. In summer months, Florida's wetlands are very susceptible to fires caused by lightning strikes. Getting ground apparatus to the scene fast can be very difficult. "We try to have an aircraft ready to attack a fire, almost like an EMS call, and try to hit that fire while it's really small." Many departments answer fire calls from the far reaches of their areas by immediately dispatching a helicopter to assess the situation and help determine what response is needed. An air crew can also spot homes endangered by brush fires and have firefighters sent to protect them. Miami-Dade will try to reduce its response time to outlying homes and businesses this year by adding two Bell 412EPs to its trio of green and white 412s. One 412EP will be assigned to the unit's Opa-Locka Airport base, with the other at its main facility at Kendall-Tamiami Airport, Hunter said. During the upcoming summer fire season, the unit will remove most of the EMS equipment from one aircraft, add water tanks and dedicate that ship and crew to calls in the wetlands. Paul Shakstad, chief pilot for the Los Angeles Fire Dept., echoed the concerns over what is called the wildland/urban interface. Affluent residents seeking expensive, secluded homes are choosing sites closer and closer to the wilderness. They often find themselves in deep trouble when brushfires break out. "We're starting to form coalitions to deal with that," said Shakstad. The LAFD has four Bell 412s and one LongRanger to support ground and harbor firefighters. Helicopter manufacturers are especially looking forward to this year. The prospect of state and local agencies with homeland security grant money to spend fuels their hopes for a prosperous year. Bell expects an increase of law enforcement sales, particularly of its popular, seven-place 407. Agencies concerned about noise find the 407's Quiet Mode option a neighbor-friendly system. With the flip of a switch, the FADEC adjusts rotor RPM to 93 percent, which significantly reduces the aircraft noise's signature. 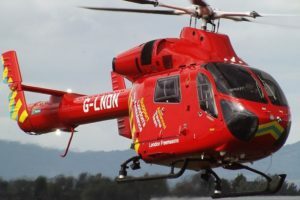 MD Helicopters "will be better funded than we ever have been" in 2005, said Colin Whicher, vice president of marketing and sales. "The funding will enable us to go back to our superb customer support." Robinson Helicopter Co.'s president and founder, Frank Robinson, is expecting "another really good year." Robinson sold more than 650 of two-seat R22 and four-seat R44 piston aircraft, the company's best year ever and a big jump over the 422 units sold in 2003. "We're already sold out for the first half of 2005," he said. Law enforcement sales are building slowly, Robinson said. The company's only police offering is the law enforcement version of the R-44 Raven II. "It's a very difficult area to build a market in." The Raven II is a muscular aircraft that has found its place as a starter platform for small agencies on a tight budget. At roughly $400,000 for a "nicely equipped" ship, it can carry a standard two-man patrol crew with thermal-imaging gear and a small searchlight system. AgustaWestland rang in 2005 with a new, $6.8-million facility at its Northeast Philadelphia Airport site. Its U.S. subsidiary, Agusta Aerospace Corp., will use the 40,000-sq.-ft structure to build the single-engine A119 Koala. The company will continue to use its original building for assembly and completions. On the police end of the Koala market, the aircraft has jumped into the light turbine fray with the sale of three ships to the New York Police Dept. and two to the Pennsylvania State Police. American Eurocopter entered 2005 with a new production facility at Golden Triangle Regional Airport in Columbus, Miss. One of the company's newest customers is the Los Angeles County Sheriff's Dept. Formerly the largest law enforcement operator of MD500s and 600s, the department will be working this year with a brand new fleet of 12 AS350-B2s. 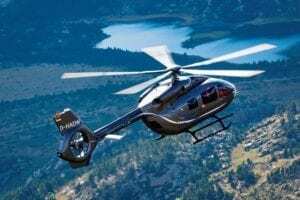 With that and a long list of other agencies flying its products, Eurocopter will be positioned to make a tidy business providing parts and support to the operators. Eurocopter's performance in 2004 was impressive. It accounted for 55 percent of all rotorcraft sold in the first half last year. Operators and manufacturers used 2004 to lay the groundwork for an interesting and exciting 2005. In December, it will be interesting to see how exciting the year truly was.